Wouldn't you agree that the neck and feet are the most ignored areas of a human body when it comes to grooming? When was the last time you applied a moisturizing cream or sunscreen to your neck? How about pampering the feet with a foot cream? Sure we spend our time at nail salons for pedicures but how many of us take care of our feet post that? I, for one love heading to the nail salon and getting that extra treatment for the hands and feet but I don't always have the luxury of time. And this is where Scholl's electronic foot file comes handy. The Scholl Velvet Smooth Electronic Foot File is one of those easy to use products that deliver remarkable results in the first go. A travel friendly device, this little gem eliminates all the manual scrubbing you usually have to do when using a standard foot file. Powered by batteries, the cordless file gently exfoliates the rough skin underneath the feet to reveal a smooth surface. The device is convenient and all it takes is a twist to get it working. While the rotating exfoliator head may appear intimidating (it reminded me of my very first exfoliator), it works effortlessly. The exfoliation is visible, just like it would be at the salon. I used the file at the base of my feet and the heels for a few seconds, alternating between each area every now and then. I was quite impressed at the end result. My feet were smooth and not irritated. There was a certain level of gratification achieved when I realized it took less than 10mins to acquire softer, smooth skin. The process doesn't hurt and won't leave you uncomfortable. Avoid pressing it too hard against your skin, though as the device may cause discomfort and eventually come to a grinding halt. The rotating head is detachable, can be washed with water and wiped clean (the device itself, however is not waterproof). Once the rotating head goes blunt, it can be easily replaced but you need not worry- if you maintain the device well, you won't need to replace it anytime soon. Overall, the file is a practical beauty tool that keeps the feet in good condition until your next pedi appointment. The Scholl Velvet Smooth Electronic Foot File is available in the leading pharmacies across the UAE, including Bin Sina. Visit www.schollvelvetsmooth.com for more info. 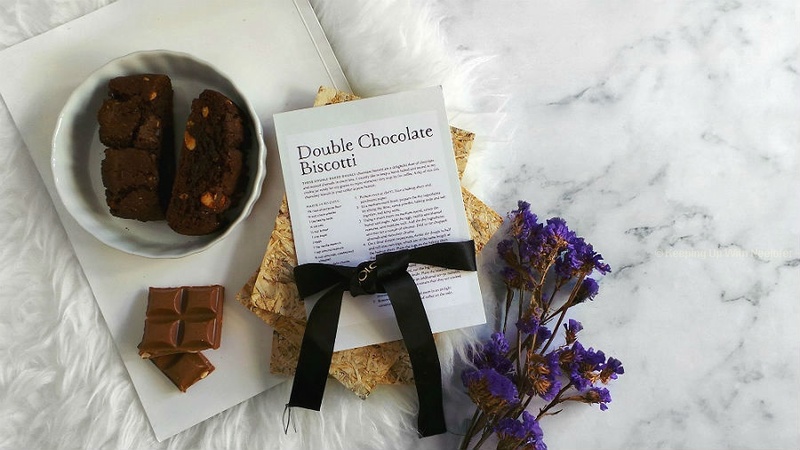 And now you have the chance to score this fab gadget! I've partnered with Scholl to give 2 of my lucky readers the electronic foot file worth AED 245 each. 1) Like my Facebook page. 2) Answer the question: What is the Scholl Velvet Smooth Electronic Foot File good for? 3) Mention your Facebook name along with your answer in the comments section. Good luck! Competition open to UAE residents only. Prizes must be collected from Dubai. The competition winners are: Ruel Robles and Fizza SK. You will receive an email shortly. The scholl velvet smooth is very good for exfoliating the feet.. Leaving it smooth and supple. The Velvet Smooth Electronic Foot File is an electronic foot file designed to remove hard skin for beautifully smooth skin after just 1 use, buffs away hard skin in minutes leaving you with fabulous feet that you'll want to show off. It has an ergonomically shaped head for comfortable use. The specially designed micralumina roller head makes it quick and easy to remove tough, lifeless skin by exfoliating the foot through a gentle and safe rotating action. Hope to win this as I'm a sporty person & really needs this for my feet... hope to be lucky!!! For perfectly pedicured feet at our fingertips. Velvet smooth buffs away hard skin in minutes leaving you with fabs feet. Its vry easy to use. Scholl velvet Smooth Electronic Foot File is good for the base of the feet and heel, and keeps the hard heel skim soft and clean. Scholl velvet smooth electronic foot file is good to exfoliate the rough skin underneath the feet to reveal smooth surface. The Velvet Smooth Express Pedi buffs away hard skin in minutes leaving you with fabulous feet that you'll want to show off. It has an ergonomically shaped head for comfortable use. 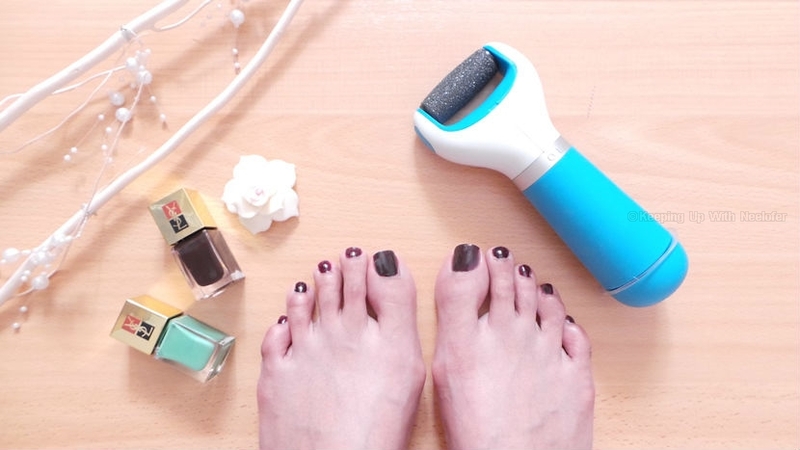 The specially designed micralumina roller head makes it quick and easy to remove tough, lifeless skin by exfoliating the foot through a gentle and safe rotating action. It is good for gently exfoliating the skin under the feet to make it smoother and softer. School Velvet Smooth Electronic Foot file is good for exfoliating the rough skin underneath the feet to reveal the smooth surface. The Scholl Velvet Smooth Electronic Foot File is an absolute wonder product to get beautiful feet. The file is a practical beauty tool that keeps the feet in good condition until the next pedi appointment. It removes the dead skin in minutes. Overall, it gives us smooth in 4 simple steps. I would really like to use this after going through the videos on their website. Followed all your steps and wish to win this fabulous giveaway. Many thanks ! 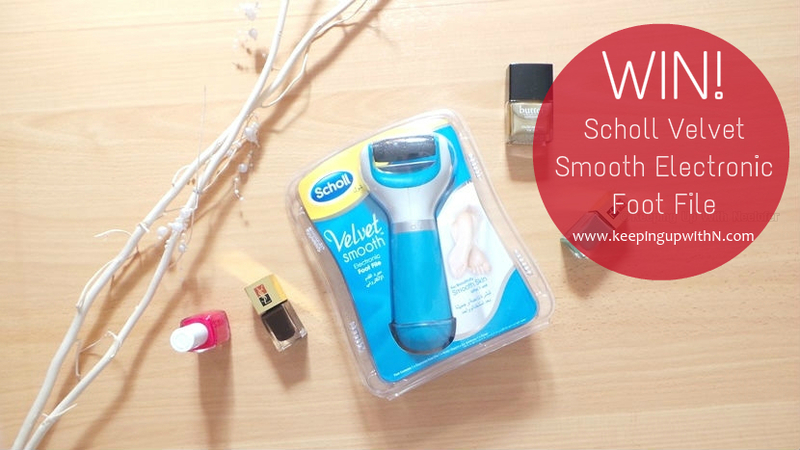 The scholl velvet smooth is very good for exfoliating the feet leaving it smooth and supple. Scholl Velvet Smooth Express Pedi Electronic Foot File is good for getting perfectly pedicured feet at your fingertips. It will get feet looking great and feeling super smooth without any hassle. It buffs away hard skin in minutes leaving you with fabulous feet. The Velvet Smooth Express Pedi Electronic Foot File buffs away hard skin in minutes leaving you with fabulous feet that you'll want to show off. The Scholl Velvet Electronic foot file gently exfoliates the rough skin underneath the foot to reveal the soft smooth surface.and keeps feet beautiful smooth and clean. The Velvet Smooth Express Pedi is good for bufing away hard skin in minutes leaving you with fabulous feet that you'll want to show off. The specially designed micralumina roller head makes it quick and easy to remove tough, lifeless skin by exfoliating the foot through a gentle and safe rotating action. This Beautifully designed handy magic gadget I would say helps to gently exfoliate the rough skin under the foot to reveal a very soft smooth surface and keep your feet beautifully smooth and clean within few minutes.. Perfect Travel partner too.. So wish to own one for myself.. Badly Need one .. Really a cost saving gadget to have.. The Scholl Velvet Smooth Electronic Foot File eliminates all the manual scrubbing you usually have to do when using a standard foot file. It gently exfoliates the rough skin underneath the feet to reveal a smooth surface. FACEBOOK NAME - Sheetal Lobo. Scholl Velvet Smooth Electronic foot File gently exfoliates the rough skin of feet to reveal a smooth feet .. The Scholl Velvet Electronic foot file is good for exfoliating rough skin underneath the feet leaving the skin smooth and soft. The Scholl Velvet Electronic Foot File gently exfloliated the rough skin underneath the foot and gives it a soft and smooth look and feel... it can be very well taken for travels and make your feet pretty at home.. wish to win this for my darling mom, who has cracked heals ..Facebook name Abid Hussain Syed .. liked and shared the post on the facebook as well !! Tha Scholl Velvet Electronic foot file is to buff away dry skin in heels in just a matter of seconds.